The state of Georgia has officially made it illegal to make a living UNLESS you are willing to ask your master for permission first (namely the state & federal government). 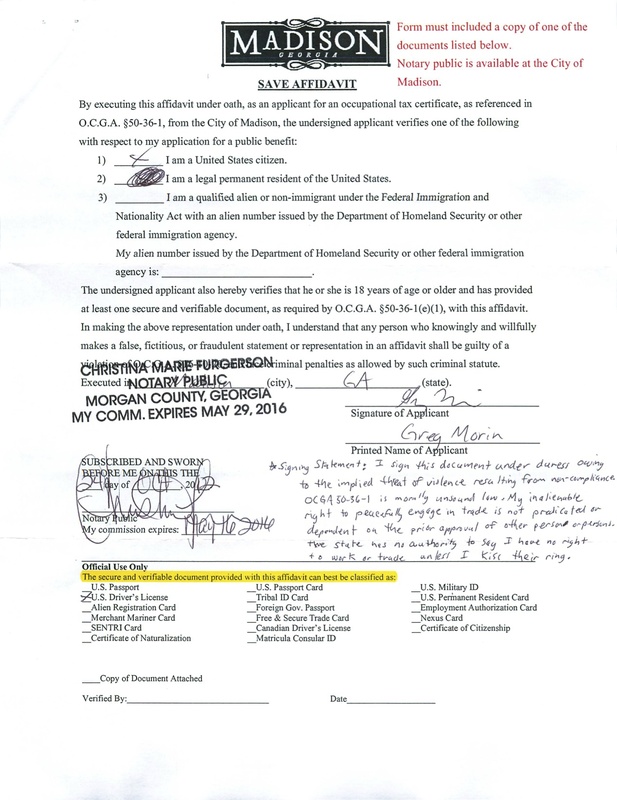 To wit: I discovered today that in order to maintain the extreme privilege of operating a business in Georgia one must now sign a sworn affidavit and provide documentary evidence that one is a US citizen. So now not only are business owners drafted into being unwilling arms of the state apparatus by being required to make their employees prove they are US citizens, but now business owners themselves must prove to the state they are US citizens (because clearly that is a real problem, undocumented illegal aliens coming to this country to establish self-sustaining businesses). What pray tell could be the rationale for this: Well according to OCGA §50-36-1 any “public benefit” one might receive requires said recipient to prove they are a US citizen. However their definition of “public benefit” is quite odd insofar as it includes “benefits” that the state itself REQUIRES business owners to obtain from the state, namely business or other occupational licenses. If a business license given to me by the state is a “benefit” that is causing them so much distress is doling out, I’ll be the first to volunteer that they can keep it. Somehow I think businesses would run just fine absent a framed piece of paper on the wall. To those not familiar with the regulatory hurdles one must go thorough to operate a business in this state (and I assume most states): this is not merely a one time annoyance, i.e. get your license and you’re done. Oh no, this is an annual event, every year I must prove to my overlords that I was a US citizen last year and oddly enough 12 months later I’m still a US citizen. I need to provide copies of citizenship records, I need an affidavit signed and notarized. A few years ago it was one form, last year it was 2, now it is 3 this year and I will be shortly required to obtain the not so euphemistically named “Federal work authorization user identification number” in order to enjoy the simple privilege of operating a business and being permitted to hire employees. This entry was posted in Current events, Georgia politics, Libertarian opinion, Uncategorized on October 24, 2012 by Greg Morin.